One must have been hiding under a rock if they failed to recognize the comprehensive career of showbiz veteran Mary Kay Place. This resilient woman has had a storied existence in entertainment throughout the decades as a TV/film actress, writer, director, producer, etc. Place may not be what one would call a household name but you have seen her perform on screen and acknowledged her collaborations on countless projects both familiar and obscure in pop culture circles. Indeed, Mary Kay Place is well-traveled and her contributions in Hollywood are well-received and appreciated. In writer-director Kent Jones's blistering small-scale character-driven drama Diane, the resourceful Place is afforded the golden opportunity to poignantly shine in a vastly affecting and sobering showcase detailing the quiet despair and dignity of one wounded woman's insistence to bypass her heavy-handed malaise for the unselfish gesture in supplying the comfort of others. As a Martin Scorcese-produced film project, it is no wonder that the heart-wrenching Diane feels hauntingly earthy in its truth of sadness and survival. For those oldsters that nostalgically recall Place's early TV work as Mary Hartman, Mary Hartman's country cutie Loretta Haggers or as baby boomer real estate attorney Meg Jones in filmdom's The Big Chill will certainly rest assure that her tremendous turn as a disillusioned but devoted caretaker in Diane will demonstrate the gifted range of this seasoned talent. Clearly, Place gives one of the year's best solid performances as a meek and mild provider on the edge of silenced detachment. Jones unapologetically serves up a sleeper grown-up gem that is not what one exactly would call an instant eye-catcher. Indeed, Jones's noteworthy narrative channeling the embedded psychological woes of mature femininity is going to be a tough sell amid the box office breakout of superhero flicks and kiddie animation. Diane is resonating in its perceptive observations concerning a stunted older woman experiencing somewhat of an undefined nervous breakdown while posing as the conscientious sacrificial lamb for hire. Place boldly portrays an aging lost soul at peace with her deprivation of self-importance as her emotional healing needs are placed on the backburner. Dramatically stimulating, revelatory, reflective, and deeply moving, Diane is a profound and probing platform for the dedicated Place to skillfully parlay her nuanced angst and soul-searching heft. 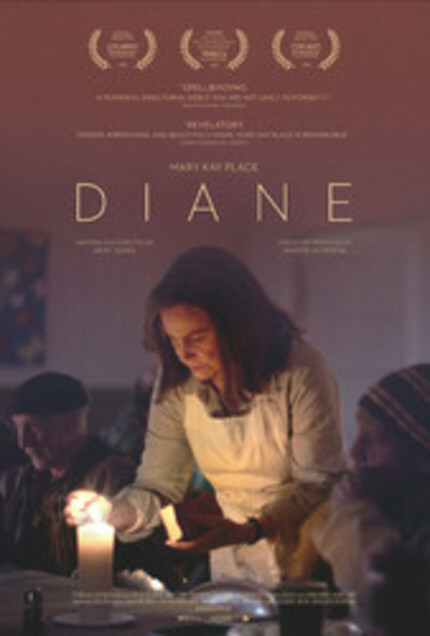 Place's Diane appears to be the supportive engine that drives everybody's uplifted spirit within her caretaking realm. The trouble is that she neglects her own self-interests and caters to other beleaguered folks. Feeling exhaustive, uncertain, and pained, Diane's main outlet for expressing her doubts and distress is rested on the shoulders of her best friend Bobby (Andrea Martin from SCTV fame). The conversations are never breezy--there are emphasized unsettling tidbits regarding illnesses, deaths and other soured fodder. However, the ultimate focus of the dour discussion is none other than Diane's pent-up frustration with drug-addled son Brian (Jake Lacy). Jake is a full-fledged drug addict that consumes all the suppressed turmoil that boils inside his broken mother. Still, Diane dotes on her insufferable offspring only to receive constant fussing and resistance in return. It is a guessing game at this point for wondering if her junkie son has relapsed for the umpteenth time or not. Nevertheless, Diane persists in mothering her disrespectful son despite the understandable nagging and nudging that goes with the territory. Diane's weary bout with navigating the tricky and treacherous backwoods roads en route to carrying out errands for the beleaguered Brian is quite symbolic of her troubled existence as she looks to stay on course in the patchy road she has traveled down so blindly. Diane is thoroughly engaging in its spotlighted numbness of a woman disguising her self-inflicted punishment as a ready-made helping hand for the immediate individuals she faithfully services. Place convincingly balances the high expectations of her character's open yet fragile heart with the low expectations of self-sabotage. No doubt that she is a community treasure--a walking wonderment of patience, nurture, caring, and positivity. If there is any condemnation aimed at Diane it is because of her lack of awareness to realize the inner happiness that she is entitled to revel in with unabashed aplomb. Perhaps Diane cannot face whatever guilt, loneliness or soulful emptiness that overwhelms her tainted psyche? The consoling of others is preferable...a convenient cop-out for the real self-examination of a plagued senior-aged woman not knowing how to search for her own worthy validation. Importantly, we sympathize with Place's Diane because underneath the generous facade is a detached woman that is compassionate but wants to feel liberated and accomplished but still cannot shake off that pesky weakness of absent self-gratification. Place's rawness and vulnerability are Oscar-worthy in mental grittiness. The supporting cast is outstanding as they contribute marvelously to the dysfunctional dynamics of Diane's damaged livelihood. It is nice to see Oscar-winner Estelle Parsons on board as one of Diane's refreshingly quirky mouthpieces. Martin is totally satisfying as a close safety blanket for Diane's confessions. Plus, Lacy's destitute druggie Brian and Charles Weldon's Tom are interesting male pawns pitted in a mostly estrogen-drenched fable. Meticulously intimate and bracing, Diane is an embodiment of ailing womanhood hinging on unclear fears, regrets, loss, and empathy. Thankfully, Place's big screen humanity based on her conflicted caretaker--no matter how flawed or misplaced--is also a reminder of how one can grasp their elusive strength and peace of mind if given the decent chance.